Hi I'm JAMES 60 and married with three daughters all left home now, daughters that is not the wife.I enjoy Gardening /Football and working on my Farm.The picture above in the header slot is where i live and work. 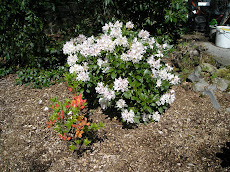 Have taken the chance to shift a lot of the bark mulch that i managed to get hold of earlier in the year in and around my Rhododendron plants it seemed an ideal opportunity after the downpours of recent days which had given them a real good watering so with a good covering of mulch now they should avoid being stressed for water as often happens late summer, which can have an adverse affect on the following years flowering , I was fortunate in that Margret and Allan next door are having some landscaping work done and so i was able to get pretty close to where i needed it by nipping across their ground with a tractor so that saved a lot of work barrowing it, as the only other access is from the front of my home and that would mean pushing it all about 75 yards instead of no more than 10 yrds when you consider i have moved at least 12 builders bulk bags full it saved a lot of hard graft. After last weekends wild weather it has taken some time to collect up all the broken tree branches and other bits and pieces that were scattered about, the only possible lasting damage was to my Brussels Sprouts which were knocked flat and twisted they do now (Thursday) seem to be coming back although the stalks are still bent and misshapen and i am not sure weather to try and stake and straighten them out or just leave them to their own devices so for the moment i have just left them, other than that was my drum of Maris Bard potatoes were flattened fortunately they were my earlies and they were almost ready to harvest anyway, all the others potatoes Kestrel and Desiree were not affected at all. What a weekend it has been absolutely lashing it down with rain and combined with wind speeds reaching 70 mph the chance of getting out and doing some work done in the garden is nil, so it a case of getting on with a few indoor jobs like trying to get a web site up and running, i haven't really got a clue how or what to do but i am not one to give up easily , does any one know how you install and create MySQL database and which is the best web host provider that will not cost a fortune, and how do you CHMOD your folders ? hum it's not going to be as easy as i thought to make my fortune on the Internet. This last week has been showery and combined with the downpour over this weekend i think i can safely say our drought has come to an end it has at least helped the plants put on some healthy growth . I did manage to take a picture of our Gunnera plant on Tuesday night it is 5ft 6inc in height and about 7 foot across not bad when you think how little rain we have had since late April when it starts growing, i think it must have tapped into an underground water supply because i never bother watering it. On the farm we have been cutting back bracken (if anyone is interested try the link http://www.chm.bris.ac.uk/motm/ptq/ptq.htm for more details) on some new land that we recently took over it is a very poisonous plant to farm livestock so we are trying to clear it, the best way is to chop it back 3 times a year for 3 years and it is usually well on the way to been cleared by then, sheep don't tend to eat it so they can safely graze among it but cattle seem to like the taste and so have to be kept well away. Their have been quite a few Scotch Thistles that needed topping as well so all in all that has kept us busy as we waite for a chance to get on with Silaging and Hay makeing. Have enjoyed a quite weekend doing a few odd job's that have been building up at home, got the chance to put in a final row of beetroot and tried to give vegy plot a weeding and tidy up things seem to be going nicely although some shallots seem to have gone flat i am growing to different types of shallots- Red Sun and Golden Gourmet and it is just one variety that has gone flat but i can't remember which one it is, in the foreground are a few Dahlias that are growing in some 9" pipes that i set up so as to stop the soil falling away it is surprising how the ground levels rise with all the old compost and FYM that get added over the seasons. The onions to the right of the shallots are varieties Rijnsburger and Red Barron and though they look well they may be just been on to rich a diet perhaps i gave the ground to much FYM last winter. My Mammoth onions are plodding on nicely but maybe a shade behind where they were this time last year when we had a lot more rain. I must try to get some wire supports for the leafs next year it's probably a bit to late to bother now. The leeks have put on some good growth in the last 10 day and i am pleased with them, i do tend to plant them closer than is recommended but i prefer them to not grow to big for the kitchen the Variety is Jolant. Some of the Runner Beans are getting to the towards the top of the canes amazing when you think they were just planted out in the end of May. Not so exciting are the short Carrots, Parsnips and Beetroot many of the Carrots got eaten by my neighbours semi tame wild rabbit and the first rows of Parsnips and Beetroot suffered from poor germination in the dry hot weather we have been having in South Cumbria but the second planting of Carrots and Parsnips on the right hand side that i did about a fortnight ago seem to be getting away nicely. The Potatoes have just stating to flower and are looking well. If you look closely you can see the Brussel Sprouts to the left. On the farm we got finished shearing the sheep on Thursday afternoon so that's another job ticked of, not that it is a worth all the effort i have just calculated that to gather and shear has taken a total of 52 man hours and the payment we got last year was a grand total of £107, this year the estimated price should lift it to about £144 the equivalent of £2.76 an hour, still the sheep should keep healthier and be more comfortable. Simon doing some shearing this morning the pictures show were we live and work although most of the sheep are sheared back at the farm this flock are quite a way from home so it is easier to take all the equipment to them and do them in the field, our office can be very quite at times and all that came to disturb the peace was a buzzard that circled over to see what was going on. but every time i tried to photograph it gave me the slip. What a difference a week can make last Monday it seemed that everything was being held back by the dry weather and drying winds then it rained on Tuesday night not heavy, but steady and persistent for a few hours, if you look carefully you can see the steam riseing with the dampness and heat on Wedensday morning, and although it's been dry since then it's been cloudy and humid and the response has been dramatic the Beetroot that I was on the verge of scraping has really sprung back in to life and grown about an inch this week, the Parsnips also seem that they might recover though i did sow a couple more rows this week just in case it still fails, it's a tricky crop to get started in my experience, sow to soon and I have no chance, plant it later like this year and it gets a server check if it gets to dry even though i did give it a lot of watering this year, still it's all part of the fun, as the ground is now damper and not baked into the hard lumps of a week ago i took the chance of putting in half a dozen Iceberg Lettuce where their was a bit of space i don't grow them from seed just some that i picked up from the local garden center it's simpler to get a few about once a month rather than have a glut all at once. Last back end my youngest daughter Susannah brought me some gourmet Carrots specially breed for container growing back from a holiday in the USA so i took the chance to get them sown this Sunday i used one of our local councils recycling boxes as a container it seemed a good use for it, I'll let every one know if they taste as good as they crack them up to be. The moisture in the ground has also made it ideal for the weeds so i had to get the hoe out and have a quick tidy up among the Leeks and Onions some of which have drooped with the earlier dry weather but I'm sure they will be fine. Just to finish of we watched Britain's got Talent on TV this weekend have to say i was hoping that Andrew Johnson would win being a Local Cumbrian lad from Carlisle but well done to him anyway thirds not to bad, and i thought that the young lady with her Collie Sheepdog was pretty outstanding I have trained a few sheepdogs over the years to work sheep, and so can appreciate how much time and effort she has had to put in to get it to do what it did, it must think the world of her to do what it did.